By now we will have heard the decision of the FIA Court of Appeal to reduce Renault's penalty from the original one-race ban. As I pointed out in my post, Thoughts on the Hungarian GP - Part 1, it was almost inevitable that the court should do so, Fernando Alonso being the main draw for Spanish fans to the Valencia GP. But this is not the reason why the reduction of the penalty to a reprimand and $50,000 fine was the correct decision; if anything, it is still too severe given the nature of the so-called offense. It takes only common sense to realize that no team would deliberately send out a driver with a wheel that was likely to come off during the lap, with the intention of calling him in to fix the problem in a second and immediate pit stop. Had the team been aware of the problem, the sensible and least time-wasting solution would have been to hold the car a few extra seconds while the wheelnut retaining device was fitted properly. How the stewards can allege that the release of the car in an unsafe state was deliberate I do not know. The incident is easy to re-construct and it occurs often in the heat of F1 racing. I have no doubt that the wheelman concerned thought the nut had gone on correctly and hastily tried to fit the retainer. Whether he knew that the retainer had not been fitted correctly is open to question but we can take it that the pressure of the moment led to an automatic raising of the hand, the usual indication that the job is complete. The lollipop man sees the hand and releases the car, unaware that anything is wrong. We should remember that the retainer is a device introduced to F1 only recently as an attempt to end instances of the cars shedding a wheel. The wheelmen are bound to regard it as an annoying addition to their main duty of changing the wheel and, when the darn thing proves fiddly and refuses to behave as expected, the temptation to accept an incomplete fitting must be strong. After all, F1 cars raced for years without them and what are the chances of the wheelnut choosing this moment to come loose out on the track? Unfortunately, the answer to that question is that it is very likely. The retainer is designed to fit easily if the nut is tightened correctly; if "it won't go in", in all probability the reason is that the nut has not been fitted correctly. But that is easy for us to work out now - not so easy for a mechanic driven by the need for speed and and only a split second to make a decision. So it is almost certain that the incident began with a wheelman's decision to accept a substandard job as good enough. The likelihood is that he thought the nut itself had been put on correctly and should be quite safe therefore; no need to advise his boss that the retainer may not have been fitted correctly. When Alonso radioed in to say that he had a problem with the front wheel and that it seemed to be a puncture, his radio man would have had no idea that the more likely cause was an incorrectly fitted wheelnut. The stewards' insistence that the team should have advised Alonso of the real problem seems illogical therefore. And the penalizing of what was an obvious fumble with a one-race ban was wildly over the top. Yes, the attitude of "eff it, that'll do" has no place in F1 and the team should be punished, with the wheelman responsible dealt with in his turn by the boss, no doubt. But this was a mistake, remember - can we really expect that such incidents will cease merely because we punish them severely? 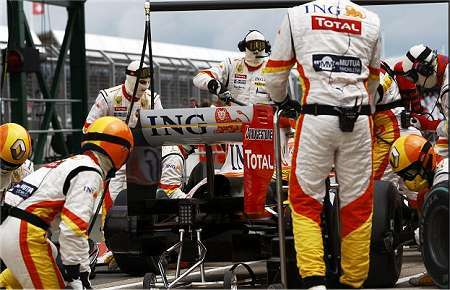 To err is human and there will always be occasions when the pressure and flurry of a pit stop in F1 causes mistakes. To my mind, even the $50,000 fine is harsh, the loss of a potential podium position and points, the embarrassment of the reprimand and the experience of the error being more than sufficient to make the team try even harder to avoid mistakes. But Renault have pronounced themselves satisfied with the reduction of their penalty and we can move on to other things. It would be nice if there were some consistency of stewarding decisions, however. As Keith Collantine has written in his F1 Fanatic blog, there have been wildly varying decisions handed out by the stewards in previous years, with exactly similar offenses savagely punished in one instance and totally ignored in another. That is the real problem and the sooner F1 introduces a system of professional and full time stewards who understand the sport, the better. Good to have you back on the blog, Clive. Did the wheelman raise his hand? I remember it as he did not and error was the lollipopman who let Alonso go, anyway this punishment is much better. Good to be back and firing on all cylinders again, Hezla! I'm not sure that the wheelman did raise his hand - I read somewhere that he began to stand up, which the lollipop man would have taken as indication he was finished. Whatever happened, a mistake was made and the original punishment was far too sever for such a thing. I agree that the fine, although still harsh, is better than a race ban. I fully agree about the stewarding situation. The inconsistency has gone on for too long. Professional, experienced, and paid stewards are needed. I also agree that a race ban for an infraction that amounts to a mistake of omission and poor communication is excessive. I respectfully disagree about the $50,000 fine. True; the team will come down on the mechanic almost as hard as he will come down on himself, but I think it is a responsibility of the governing body to respond to a mistake that places others at risk, intentional or not. Imposing a sanction on the team ensures that the team, as a whole, recognizes the mistake and responds to correct it. Most sports require the referees to be objective regarding rule infractions and claiming one "didn't mean to do it" does not come into consideration. I think, as you pointed out, the real issue is consistency. If we knew that an unsafe release would always result in a $50,000 fine or perhaps a drive through penalty, we might not be so up in arms about it. Is there no Fixed Penalty to cover these human errors? There seems to be an awful lot of over-reaction on the part of the stewards these last few seasons. Very often the initial punishment is overturned through appeal procedures. If there is a procedure for appeal, it would seem the most obvious thing to do would be to have similar procedures for the initial crime. "I'm not sure that the wheelman did raise his hand - I read somewhere that he began to stand up,"
Well, typically the F1.com video shows a pointless blur effect, so you can't see what's happening there, but the BBC replay shows clearly what I remember seeing at the time - one of the mechanics is signalling ready, and another is still trying to position the spinner, and is still trying to do so when the car moves off. Marc: Well, I did say that it was my opinion that even the fine was a bit harsh but I am quite open to being wrong on that. My main point is that penalizing human error does not prevent it happening again. Good luck to the FIA if they think they can achieve that! You are certainly right about there being more standard penalties, especially for common offences. Fractal: Thanks for the welcome back. It becomes ever more obvious that F1 needs a much better stewarding system, beginning with permanent stewards who understand the sport and know the rules. There is controversy over every stewarding decision these days, mainly because virtually anything may issue from a stewards' meeting, ranging from race bans to a rap over the knuckles. It is not the way to run an international sport. Mr Soap: So it was the lollipop man's mistake, not the wheelman's. Yet still a mistake and a common one indeed - the heat of the moment is what it's all about. And that is why the stewards seem so ignorant of the sport, in handing out a race ban for a mistake that had already cost the team and Alonso any further part in the race. The inevitable conclusion has to be that they were unduly affected in their judgement by Massa's accident and the death of Henry Surtees. How many times have we seen pit stops when wheels 'won't go on'. I haven't seen a detailed design of the wheel mounting, but surely in an age when F1 cars can run upside-down, a mounting method can be designed that is foolproof. A similar situation applies to fuel rigs that jam, but that won't be a problem next season. Great to see you back Clive - I've almost worn my browser out looking for your latest article ! Well, I wouldn't say it was anyones fault really. It was a systems failure. Having watched a fair few teams pitstops, it seems that any one of the three men on the wheel can try and position the spinner. Red bull have the guy who takes off the tyre do it, renault have the guy who puts on the tyre do it*, and ferrari have the man with the wheel gun do it. Notably, on the teams who don't have the wheel gun do it, the wheel gun guy signals the tyre is done as soon as the spinner is reached towards - it takes a fraction of a second. So in this case, the tyre was slightly late on as compared to the rest, and the wheel gun signals the tyre is ready before it is, but unlike all previous times, this leads to a mistake as the fuel took a much shorter time, and so wasn't the limiting factor, due to the three stop strategy. Everyone did their job correctly, but due to the unusual circumstance of the three stop strategy, and the late fitting tyre, a weakness in how their pit stops were done was shown in a rather embarrasing way. I'd imagine in future, the guy who signals the tyre is ready will be the last man to have contact with it, as compared to what happened previously. * - It actually seems to vary with renault, depending on who has their hands free first. The stewards are terrible but they are only a symptom of the real problem. The FIA employs them as disposable articles. They are pawns. A proper and useful punishment would have Renault sending the pit crew and design team before a group of diagnostic engineers to find a solution. Pumping thousands of dollars into the FIA coffers while they are preaching cash conservation is hypocrisy. DWinn: I know I should have written something to explain my absence and my guilt remains on that score. My only excuse is that I needed a complete break so badly that I could not bear even opening the blog - it was easier to hide elsewhere! As to the design of wheel mounts, it's hard to think of a better system (bearing in mind that it has to be quick) than a dirty great nut that holds everything together. To some extent, the modern wheel covers complicate the matter, however, and I think they should be banned anyway as both movable and re-movable aerodynamic devices. Ron Dennis made the point that they contravened a section of the regulations that outlawed swapping bits of the car at will (although admittedly that could be applied to the wheels too). Nick: Good to be back and raring to go. I don't think I'd trust Todt as far as his wife could throw him. My view is that if th lollipop man went before the whell mechanic signaled that is human error and not deserving of any real punishment. However if the mechanic knew the retaining device was not engaged and signalled anyway then a ban is deserved. F1 needs to take sagety seriously. There needs to be a sufficiently draconian penalty that no-one in future thinks it is worth the gamble. For all we know every team on the grid habitually releases the car with a retaining device not engaged properly. Any team wilfully neglecying safety deserves to be hammered. As ever the ptoblem is the stewards and their polotical masters.